New York financial guru Alvin Hall continues to uncover the places where people are investing during the credit crisis, this week turning to fine wine. Interest in wine as an asset class has been growing - sales through auctions are increasing and a well-stocked cellar is becoming a status symbol for the new ultra-rich. But how much does collecting wine cost, and what is the best way for an investor to start, and store, a collection? Alvin talks to collectors and dealers, and peeks behind the secret door in New York's 21 Club - where covert drinkers gathered during America's prohibition - to explore the vaults that now house celebrity wine collections. Wine clearly is big business, but, Alvin asks, is it best suited to pleasure or profit? 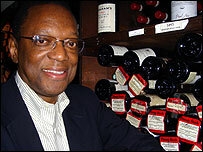 Alvin Hall's World of Money: Wine was broadcast on BBC Radio 4 on Saturday 26 July at 1204 BST. A longer version of the programme was broadcast on Monday 28 July at 1502 BST.